This is an intriguing recording. I can find only one other recording of a work by this composer, a Prelude played by none other than Marc-André Hamelin on Danacord as part of the 2011 Husum Festival of Piano Rarities. 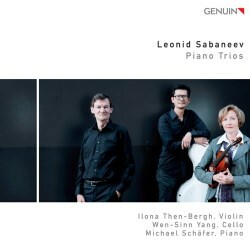 Therefore, I suspect none of you reading this will ever have heard of Leonid Sabaneev, unless you bought this recording back in 2012, hence some biographical information is essential. He began piano studies at the Moscow Conservatory at the age of seven with Nikolai Zverev, with whom Rachmaninov and Scriabin were also studying at the same time. His other teachers included Rimsky-Korsakov and Sergei Taneyev. He turned away from music at university, emerging with a degree in mathematics. Only later did he return to music, and became the Soviet Union’s most prominent music critic. Apparently his opinions of other musicians in his articles were “highly subjective” and he also proposed that the octave should be divided into 53 tones. He published a scathing review of Prokofiev’s Scythian Suite in 1915, based on a “performance” that didn’t actually occur. In 1926, his outspokenness made him unpopular with the authorities, almost a decade before Shostakovich started to have problems, and fled to the West. He taught music in Paris and among his students were Dag Wirén and Gösta Nystroem. His relatively small list of compositions date mostly from his time in Russia, the second trio (Sonata) being one of his final works. Both “trios” are unconventional, not only in their naming, but also in their structure. Each is cast in a single movement, though with distinct sections played attaca. The Australian composer and academic, Larry Sitsky, devoted a chapter in his book Music of the Repressed Russian Avant-garde to Sabaneev, which can be accessed through Google Books. Don’t be deterred by the avant-garde label; if these works were that way out, I wouldn’t be writing this review. The early Trio-Impromptu is essentially late romantic, with a certain French fin de siècle feel to it, laced with dramatic outbursts. The Sonata is very different and hard to pinpoint. Clearly Sabaneev became embittered, perhaps by the Great War and/or a number of years of Communist rule. It is angry, dissonant, even despairing in the final movement, but the same Romantic sensibility that pervaded the Impromptu is still there, just fighting to be heard. I have seen one suggestion that this work is akin to Rachmaninov mixed with Shostakovich, and there is some validity to this. The first section is the most romantic of the four, opening with a sad but rich melody, underscored by a heavy tread in the piano’s left hand. The second is heavily dissonant, while the third is less so, but its title of Romantico seems to have been given sarcastically. The final section seems destined to be consumed by despair, before a sad but beautiful slow dance briefly emerges, but this is blotted out by a bitter ending. It is a work that is more impressive than enjoyable. The performances are excellent, which is a good thing, given there seems little chance of another recording coming along any time soon. The notes are informative up to a point, but have a tendency to run to florid hyperbole, as exemplified by the concluding remarks on the sonata: “this work lies at the extreme outer limits beyond which no more art is possible and only the endless night of nameless terror waits.” The booklet was not supplied by eClassical; I obtained mine through the Naxos Music Library and it is also provided at ClassicsonlineHD.